On Friday, when discussing the market's miraculous reversal from the worst December since the Great Depression to the best January since 1987 (just a few months prior to Black Monday), we pointed out that "something strange happened: at a time when stocks had continued to surge of 6 consecutive weeks, investors were not buying it the market's latest miraculous recovery, and according to EPFR, this week saw wildly risk-off flows with $9.4 billion allocated to bonds while $15.0 billion was pulled out of equities." 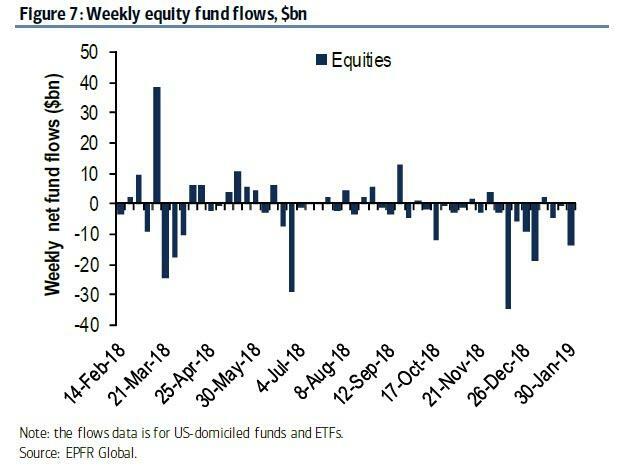 Furthermore, as Bank of America's Michael Hartnett pointed out in his latest Flow Show, not only were billions pulled out of US equity funds, with outflows on 10 of the past 11 weeks, culminating with $12.1BN in ETF outflows and $2.9BN in mutual funds outflows this week, but US equities have suffered record outflows in the past 3-months, amounting to $82.0BN, equivalent to a whopping 2% of all AUM, i.e. consistent with US equity bearishness at "events" & "big lows" of past decade. Which prompted us to ask the question: was the recent rally just one giant short squeeze? One look at the recent action in the dramatic surge in the most shorted stocks since the December 24 lows, certainly would suggest that with investors seemingly pulling money out of stocks, the move higher was largely if not entirely due to a panic scramble to cover shorts, due to Mnuchin's appeal to the "plunge protection team" on Dec 23, and then to the Fed's dramatic dovish reversal. While we don't know the answer - yet - we do know that this question of just who it was that bought stocks is puzzling not just us. 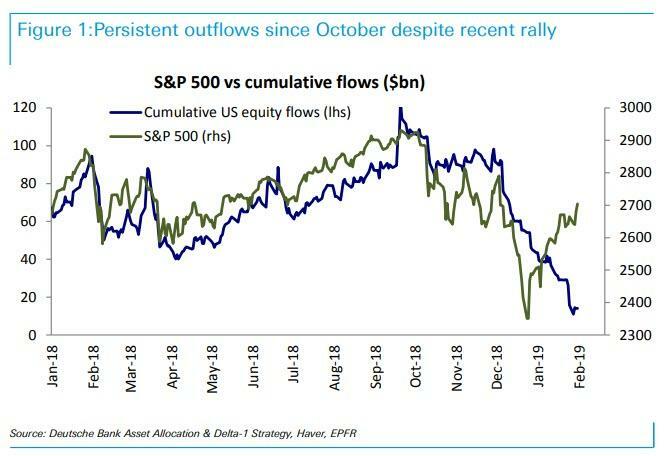 As Deutsche Bank's Parag Thatte writes in his latest weekly flows report, echoing precisely the question we raised on Friday, while the S&P 500 rallied +15% since late December, equity funds have continued to see large outflows. 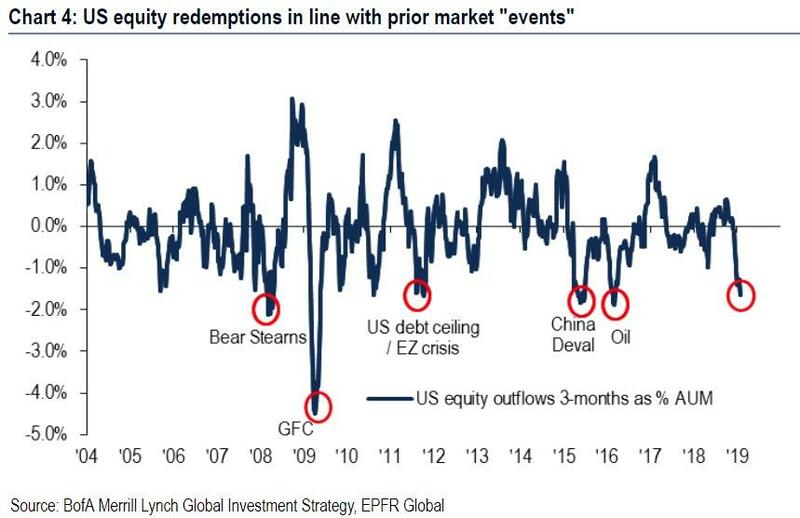 As Thatte elaborates, "US equity funds in particular have continued to see large outflows (-$40bn) since then, following massive outflows (-$77bn) through the sell-off from October to December." 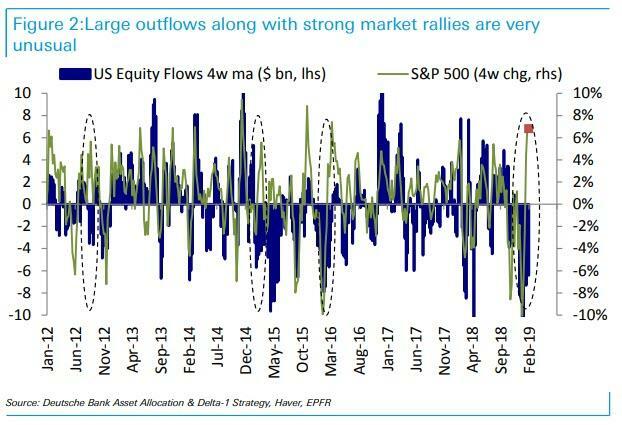 To Thatte this is rather bizarre because, as one would expect, "strong rallies eventually prompt inflows." This is hardly a shock: after all, it is only human, and trader, nature that historically there is a strong correlation between equity market returns and fund flows. In other words, all else equal, this rally does not make sense. As the Deutsche Banker points out, there have been very few periods when the market rose more than 5% accompanied by outflows. In two of those periods, after the early 2016 growth panic and the European financial crisis, inflows eventually returned with a few weeks lag. An exception was in early 2015 when outflows persisted as US data continued to weaken significantly. One, data surprises have turned up from negative to neutral and flows typically follow. 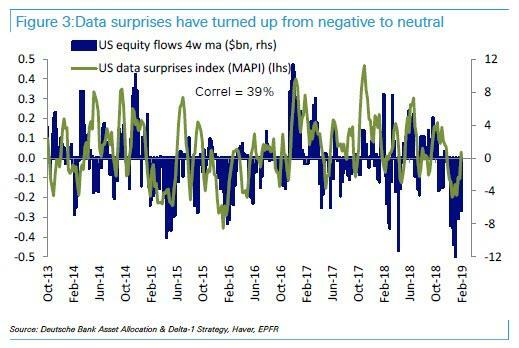 The outflows in the last few weeks were in line with US data surprises turning negative. Data this week however has bounced up, especially with payrolls and the ISM surprising to the upside and our index of US data surprises, the MAPI, has returned to neutral again. Two, with rates no longer falling hard the equity to bond rotation should abate. 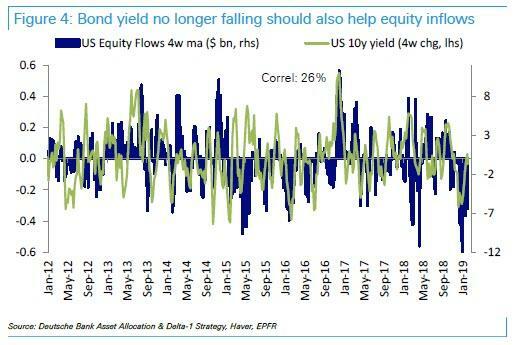 Falling rates and therefore fixed income rallies tend to draw inflows. Rates fell rapidly from November with the market re-pricing Fed expectations, and this week's Fed announcement brought validation. Of course, it is quite possible that outflows persist, in which case it is only a matter of time before the squeeze fizzles and the net selling returns, sending stocks lower once again. 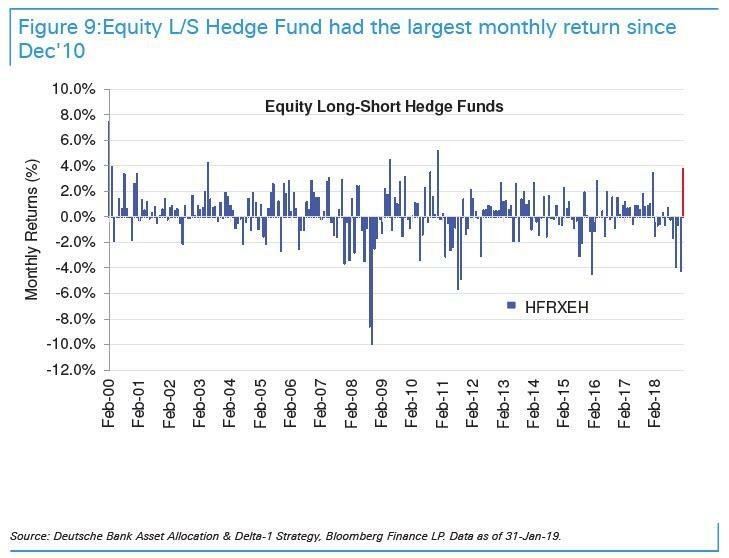 Until then, however, at least the hedge funds are enjoying their (brief) moment in the sun, with Equity long/short hedge funds having had the strongest month (January) since December 2010. As Deutsche Bank notes, after a challenging 2018 - the worst year for the 2 and 20 community since the financial crisis - equity L/S kicked off 2019 with a strong start as returns of +3.7% were the strongest month since December 2010. That said, the spike in HF performance wasn't thanks to alpha generation, i.e. value added, but instead PMs invested in US equities were likely helped by the beta rally, long-short factor rally, and gross re-risking. In other words, the surge in the market coupled with the short squeeze helped net long funds. Some other observations: Deutsche Bank's proprietary long-short Hedge Fund factors rallied as top $-longs outperformed top $-shorts; 1M Reversal rallied strongly YTD, while 12M-1M Momentum experienced a significant drawdown reflecting a strong reversal in winners and losers versus Jan-Nov'18. So where does this put us? Well, somewhat ironically, even though Donald Trump urged Americans to buy stocks on December 25, saying it's a "tremendous opportunity to buy. 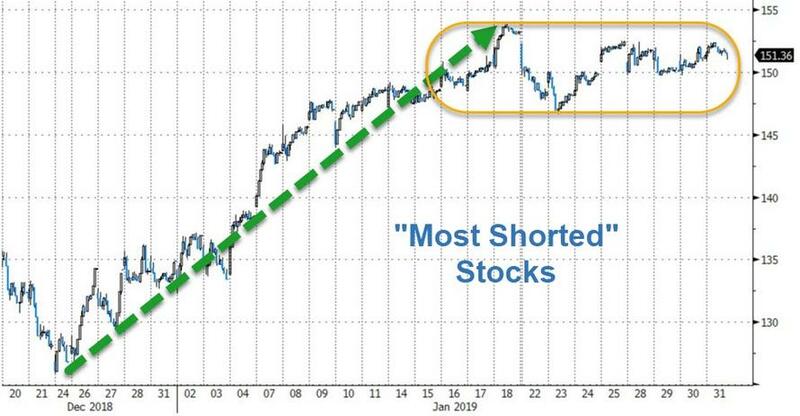 Really a great opportunity to buy" - and in retrospect he was spot on - few did as the president adivsed, as the selling accelerated ovver the next month... and yet stocks did surge, as shorts got steamrolled and hedge funds had their best month in almost a decade. How much longer will the "non-sensical" Trump rally continue? Perhaps the moment flows reverse, and investors start allocating capital to equities - as one would expect in any normal market - it is a safe bet to assume that that would mark the market peak, and the retest of the December 2018 lows will be on deck.